The year was 1941. For years the world had been threatened by Germany and its allies. On December 7 the Japanese attacked Pearl Harbor, the United States naval base on the island of Oahu in Hawaii. When the attack was over 2403 Americans were dead and 1178 were wounded. Eighteen ships had been sunk and 188 aircraft destroyed. Then Japan attacked other targets and declared war on the United States and Great Britain. The Americans, British, and Canadians in turn declared war on Japan. Four days later Germany, Italy, and Japan signed an agreement to fight together and the U.S. Congress declared war on Italy and Germany. The long and costly war had begun. Major battles were fought throughout Europe and the Pacific from 1942 to 1945. The dollar cost alone to the United States had been $275 billion and 150,000 soldiers had been killed. In England over 60,000 civilians had died. In May 1945 Germany unconditionally surrendered to the Allies. Japan was called upon also for an unconditional surrender or face utter destruction, but they continued doggedly on and refused to surrender. It was at this point the United States decided to use the atomic bomb that had been developed to bring an end to the hostilities. In 1905 Albert Einstein published his theory that large amounts of energy were locked inside atoms. He urged President Franklin D. Roosevelt to begin nuclear research lest Germany develop a weapon first. He later regretted his part in these beginning stages of development. A research project was started in the desert of New Mexico. Los Alamos was the center and it was called the "Manhatten Project" which was led by Robert Oppenheimer. President Roosevelt died and Harry S. Truman became President of the United States. He must now make a decision about the bomb. Some scientists wanted Japan to be warned about the impending bombing and for the bomb to be dropped in an area where there were no people. However, their message never reached President Truman. 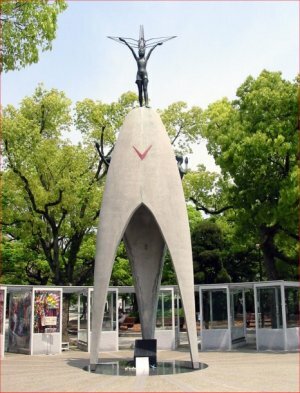 On August 6, 1945 the first bomb dubbed "Little Boy" was dropped from the B29 plane Enola Gay on the city of Hiroshima, Japan. 70,000 people were killed and 80,000 wounded. Another 60,000 would die from the effects of the blast and radiation. While the Japanese were making up their minds, another bomb was dropped on Nagasaki and thousands more died. Japan wanted to keep their Emperor Hirohito, but finally agreed to the unconditional surrender and President Harry Truman announced the end of the war on August 14, 1945. The Emperor was allowed to remain as a figurehead, but he had no power. It was estimated that 30-50 million people were killed in World War II, half of them civilian, but the war was finally over. It is against this historical background that we begin our story of Sadako Sasaki born on January 7, 1943. She was a two-year-old living with her family in Hiroshima when the bomb was dropped on the city. Their house was about a mile from the center of the blast. She was not hurt or burned at the time even though the house was destroyed, but her grandmother was killed in the raid. Over time their lives returned to normal and Sadako for years did not show any effects from the exposure to radiation from the bomb. However, in 1954 when she was eleven years old and in sixth grade tragedy struck. Sadako was a good runner and when she was running in a relay race she appeared pale. In a few weeks she caught a cold and developed lumps in her neck. Her condition worsened and she was diagnosed with leukemia, which is a kind of cancer, and the doctors gave her a year to live. When a person has leukemia the bone marrow makes abnormal white blood cells and these cells crowd out the normal blood cells. One cause of leukemia is exposure to very high levels of radiation such as the radiation the family received when they were in the path of the atomic bomb. Not everyone exposed developed cancer, but Sadako was one of those who did become ill. Her friends from school visited her. Sadako was told of a legend. According to the legend if a person would make a thousand paper cranes their wish would come true. 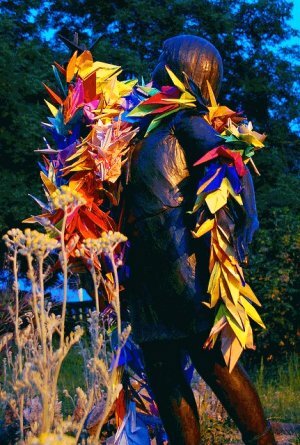 She thought if she folded a thousand cranes she would become better, so she started folding and making the paper cranes. The crane in Japan is one of the mystical creatures and is said to live for a thousand years. Sometimes paper cranes are given as gifts for special occasions. Origami paper is usually used for making them but Sadako made the birds out of any kind of paper she could find..
Click the picture for more about 1000 origami cranes. View an animation to learn how to fold a peace crane. The first quote below is from the story at the virtual museum at the Peace Memorial, and the second from an article in the Chicago Tribune. "By the end of August, less than a month after she started, Sadako had 1,000 paper cranes, but she continued to fold." 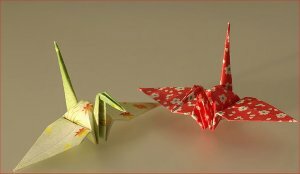 other patients' get-well presents, Sadako folded cranes. In the end, she had many more than 1,000." But another story began to be told that she, in fact, did not complete the thousand paper cranes, but only was able to fold 644 and her friends at school completed the other 356. On October 25th, Sadako passed away. Paper cranes were put in her casket with her when she was buried. 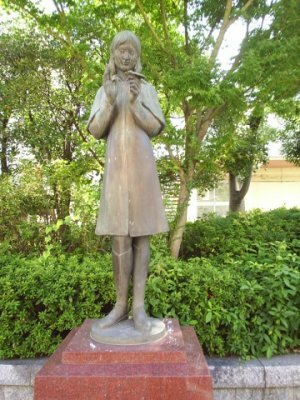 After her death her schoolmates raised money for a memorial to her and in 1958 a statue of Sadako holding a golden crane was unveiled in the Hiroshima Peace Memorial in Hiroshima. Also in Seattle, Washington a statue of her has been put in the Peace Park. Sadako's aging brother has donated atiny paper crane made by his sister when she was dying of leukemia. He requested that it be placed in the Visitor Center at the ground zero location in New York City where so many were killed in the 9-11 attack. 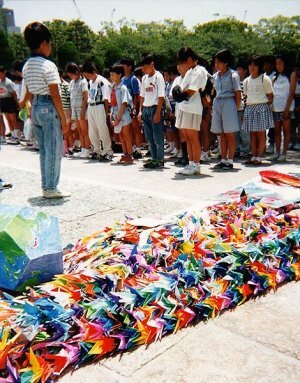 Sadako Sasaki and the paper cranes have become a symbol of peace for children all over the world. Memorial and buildings to protect the paper cranes. 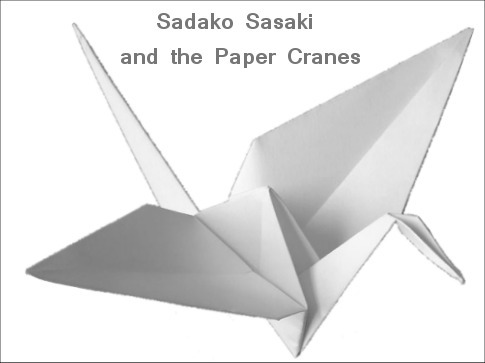 Activity: "Sadako and the Thousand Paper Cranes"
Press "Go" to search for books about Sadako Sasaki. This page displayed 68,586 times.